ALBUQUERQUE, N.M. — Hong Hou is the CEO of one of the largest publicly traded companies in New Mexico, and Dan Neal helped commercialize a device that has helped improve the vision of more than a million people. The entrepreneurs are former Sandia National Laboratories scientists who left the Labs under the Entrepreneurial Separation to Transfer Technology (ESTT) program and are among eight current and former Sandia employees being honored at the inaugural Entrepreneurial Spirit Awards ceremony at Sandia this week for their success in turning innovations from the Labs into successful businesses. Dan Neal, who left Sandia in 1996 to start a company that is now part of Abbott Laboratories\’ Medical Optics division, received an award for his participation in Sandia\’s Entrepreneurial Separation to Transfer Technology program. Click on the thumbnail for a high-resolution image. The award ceremony is part of Entrepreneurial Spirit Week being held to raise the profile of entrepreneurism at the federal laboratory. It also includes the Innovation and Intellectual Property Celebration for about 300 Sandia researchers who received patents or copyrights and licenses in 2009 or were nominated by their directors for their innovative spirits. The events are being held to inspire Sandia employees who would like to pursue business opportunities, like Hou and Neal have done. Hou left Sandia in 1998 to expand EMCORE Corp. from New Jersey to Albuquerque, where the company is headquartered today. EMCORE, which produces photovoltaic technology to power satellites and fiber optics to provide high-speed communications, has more than 350 employees and hopes to hire about 80 more employees. Neal left Sandia in 1996 to start a company called WaveFront Sciences Inc. that was recently acquired by Abbott Laboratories and is now part of the Abbott Medical Optics division. The company, which employs about 50 people in Albuquerque, has sold 800 units to researchers and ophthalmologists around the world to help them measure the human eye, often in preparation for LASIK surgery. 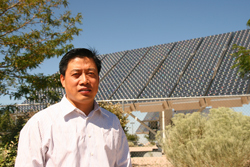 Hong Hou, CEO of EMCORE Corp., was honored during Entrepreneurial Spirit Week at Sandia. Click on thumbnail for a high-resolution image. “I estimate that more than a million people see better today, and that’s a very direct benefit of the technology that we developed,” Neal said. Both men took advantage of the ESTT program when they left Sandia. The program guarantees Sandia employees reinstatement if they return within two years, and employees can request an extension for a third year. Since 1994, nearly 140 Sandia employees have participated in the program and ESTT alumni have started 44 companies — 38 in New Mexico — and expanded 47 companies, including 20 in New Mexico. “The ESTT program gives you a sense of security or a safe haven to go out and explore the world,” Hou said. 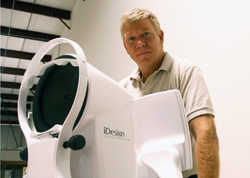 Tom Brennan, who co-founded Micro-Optical Devices Inc. (MODE) in 1996 to commercialize products based on Vertical Cavity Surface Emitting Laser technology. MODE was acquired by EMCORE for about $34 million and he now works with ARCH Venture Partners and LabStart trying to bring more technologies from federal laboratories into the marketplace. Tim Estes was Sandia’s first ESTT entrepreneur. He left in 1994 to found Conductor Analysis Technologies Inc., a global provider of market critical data for printed circuit boards that is still prospering after 16 years. Karl Gross left Sandia in 2003 to found Hy-Energy LLC in Newark, Calif. The privately-held company, a subsidiary of Setaram, Inc., designs and manufactures high performance test and measurement instruments. Jeff Nelson, left Sandia in 2000 to become the chief technology officer of Uniroyal Optoelectronics in Tampa, Fla. He returned to Sandia in 2004 and now manages the Materials, Devices & Energy Technology Department. Ellen Stechel took ESTT in 1998 to join the Ford Scientific Research Laboratory. She later returned to Sandia where she is manager of Energy, Climate & Atmospheric Management. Regan Stinnett, who left on ESTT in 1995 to found Quantum Manufacturing Technologies, Inc. Stinnett returned to Sandia, where he manages the Organic Materials Department. Since his return, Stinnett has been instrumental in establishing the National Institute for Nano-Engineering (NINE), an award-winning public-private partnership led by Sandia.